Having a top-notch site with seamless check-out is critical to compete. Toptal eCommerce web development services deliver results for clients across every platform. Having an intuitive eCommerce site design is the difference between hitting goals and losing customers. Top designers allow you to effectively map out complex purchase decisions, increase conversion rates on your checkout forms, and more. As the preferred choice of Amazon, Shopify is a rapidly growing platform with functionality for SEO and an internal app store. 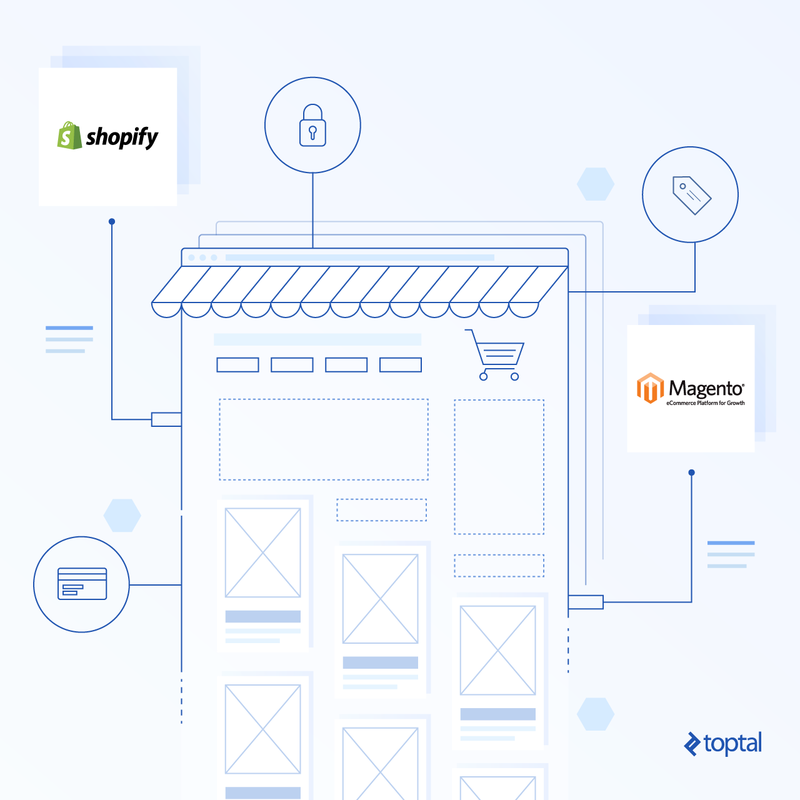 Toptal's Shopify specialists can help your company transform the way you use the eCommerce platform. An open-source plugin for WordPress, WooCommerce is designed for small- to medium-sized companies. Certified developers, WooExperts, can unlock the platform’s full functionality and help differentiate the customer experience. Used by 1 out of 4 online retailers—including Warby Parker, Samsung, and Nike—Magento is an open-source eCommerce platform written in PHP that is powerful, flexible and completely scalable. With a focus on extensibility and efficiency, BigCommerce provides top speed with some of the lowest costs in the space. Developers can work with the platform’s powerful API to create customized solutions to fit your business. The platform is built on top of Drupal Core, an open-source CMS written in PHP, allowing it to be content driven, flexible, and extensible. The inherent flexibility creates a rich environment that can be fully exploited by Drupal developers. Free and open-source, OpenCart is one of the leading eCommerce solutions in China and growing around the world. OpenCart is responsive by design with built in SEO features, and it uses an MVC-L software architecture for developers. nopCommerce is an open-source solution based on ASP.NET MVC and MS SQL Server with value (it’s free). Because of the solution’s well-defined and simple architecture, developers can make modifications efficiently without sacrificing quality or safety. While designed to be accessible to all technical levels, Zen Cart also is freely customizable down to the source code. Developers working on the PHP-based platform have nearly unparalleled levels of freedom. Here is what Toptal's eCommerce specialists are saying about eCommerce web development. In 2015, the average eCommerce customer spent an estimated $1,800 in the US and $1,600 in the UK. The next year, 53 percent of internet users (approximately one billion people!) made an online purchase. Current eCommerce sales account for just 8 percent of retail sales in the US and 14 percent in the UK. eCommerce marketing technology (“MarTech”) has proliferated accordingly, and as of 2016 over 3,500 different types were already available for online stores. Mobile platform expansion has brought with it some new possibilities and channels for online sales: Nowadays, only 11 percent of users access the internet via desktop only. Most users are using multiple devices. Statista, a data science and statistical forecasting firm, found that US eCommerce sales reached $396 billion in 2016 and predicts them to grow to $684 billion by 2020. With such growth predicted, it’s no surprise that offline-only businesses are increasingly making the leap into the eCommerce world. Don’t know where to start? You’ve come to the right place. The first step is choosing the main platform for eCommerce website development. Choosing the right eCommerce platform can be crucial for building a successful online store. There are many choices, but the most widely used are Shopify and Magento. The main difference between them is scale. Daily sales, products, attributes, customers, and third-party integrations are all factors in choosing an eCommerce development solution. A store with less than a thousand products, a few orders per hour, and without complex third-party integrations can use a self-hosted or cloud-based eCommerce solution like Shopify. They save time and development costs compared with custom platforms, where every detail of the complete structure needs attention. But integrating with external services, ERP solutions, or external data providers requires a level of customization only eCommerce platforms like Magento allow. Since Magento is the most popular, we’ll focus on it for the rest of this article, but all eCommerce platforms require very similar steps. First-time eCommerce merchants are often unaware of the real complexity of “building a web store” without prior consultation with eCommerce experts. Taking the project for granted can cause budget issues even in its early stages. For example, merchants post job descriptions like “Magento developer needed for building Magento site,” wanting a single developer with all possible web development skills (back-end and front-end) to finish in a month. Unfortunately this is not a realistic timeline. Actual eCommerce website development includes platform (Magento) installation and configuration, installation of third-party modules, development of custom modules, new theme development, and speed optimization, to name a few of the steps. Building an online store from scratch requires at least two (we recommend at least three) people to handle all the challenges successfully. Further, you can expect the project to take at least two months. The complexity of eCommerce development means splitting it among back-end and front-end developers. It is often the case that eCommerce experts specialize in one or the other, so searching for an eCommerce developer should be extended to at least one of each. We highly recommended looking for developers with previous eCommerce experience. Certification in eCommerce platform(s), in this case Magento, is definitely the advantage you should look for. Hosting providers often declare their service as eCommerce- or Magento-optimized, but this is not always true. Unfortunately, there have been a lot of cases in practice where a hosting provider has sold their non-optimized hosting package to a merchant prior to the merchant’s consultation with the developer/consultant. That leads to performance issues no matter how much the code is optimized and improved. Early-phase consultation on hosting service setup with an experienced eCommerce developer is the best way to go for any project—but it’s equally important to include a system administration expert in the discussion if possible. While working on wireframes for the project, we recommend including the default eCommerce platform screens and functionality as much as possible. Most eCommerce platforms’ screens are already user experience (UX) optimized. Changing the functionality on the front end drastically harms the UX and therefore your conversion rates. Some designers are less familiar with eCommerce UX optimization. It can happen that a designer removes an important part of the front-end functionality, counting only their artistic impression and forgetting the functional aspect of the site. Again, this can harm conversion rates. We highly recommend connecting the designer with an experienced eCommerce expert in the design phase of the project to avoid functional mistakes, or finding an eCommerce-specialized website designer to begin with. Designs for the most visible front-end elements should be as detailed as possible. Otherwise, a front-end developer will need to figure out the design of particular elements on their own, and you may not like the result. This is one of most important things to take care of: Online store conversion rates highly depend on site speed. In 2015, 39% of users would ditch a site that takes too long to load—and it’s doubtful that consumer patience has increased since then. Supplementing a quality host with a content delivery network (CDN) is recommended. Such services often drastically improve loading speed because they also provide automatic script compression and optimization, image optimization, and caching for static content. After hosting quality as we mentioned above, there are several other aspects of eCommerce website optimization that need to be covered, starting with custom code quality. Quality here will definitely be higher from experts with experience on large-scale eCommerce websites. When it comes to coding, they will know best practices as well as speed and maintainability optimization techniques. First, use the built-in features you have available for your eCommerce platform, and only turn to third-party modules to avoid reinventing the wheel in custom development. Every module adds complexity to your project, so choose them carefully to keep your store stable and responsive. These are some of the most important aspects of an eCommerce UX, having a direct impact on conversion rates. They need to be functional, usable, and fast. But their speed is very sensitive to custom modifications. Without careful profiling and optimization, there is a chance that conversion rates are going to drop. Checkout is often an underestimated part of the eCommerce website. Further, there is no generally accepted best method online due to differences in products and target customers. One-page checkout—The default checkout implemented in Magento v1. Several steps are loaded sequentially within the same page as the customer populates the requested data: Billing and shipping addresses, selection of shipping method, selection of payment method, and order summary with a “Place Order” button. Two-step checkout—The default checkout implemented in Magento v2. This is similar to the above, only several steps are aggregated together: Shipping and billing addresses alongside selection of shipping method, selection of payment method, and order summary are included in the same view. External checkout options like PayPal Express—Redirects the customer to the third-party URL out of the store and returns back to the main store upon completion. It is easier to implement, and all the risk of credit card data theft is transferred to the third-party provider. The impact on conversion for each type of checkout is often company-specific. The general rule is that checkout screens should be built with a minimalistic design. Remove all elements of distraction, like the main menu, header elements, and even the footer. This forces the customer to focus on finalizing the purchase. Easily the most important aspect of the site, security should never be underestimated. If attackers inject malicious code into an online store, they can steal private information like credit card data without the merchant even knowing. Coding best practices, avoiding custom files in the webroot, forms protection, and proper setup even on the hosting provider’s side are crucial for preventing attacks. Updating your store immediately whenever new versions and security patches are published is just as important. Unexpected slowdown? Weird admin accounts appearing in the back-end? Audit your platform and custom code. For Magento in particular, MageReport is a great online scanner for detecting security-related issues. Run a tool like this regularly. Distributed denial-of-service (DDoS) attacks in particular can be countered with CDN services like CloudFlare. Hiring eCommerce experts and building a quality online store is not an easy task. The booming eCommerce industry is waiting for you—and with some careful selection and planning, you can be a part of it too!